Verstappen took his 10th FIA F3 win at Hockenheim. © FIA F3 Media Services. 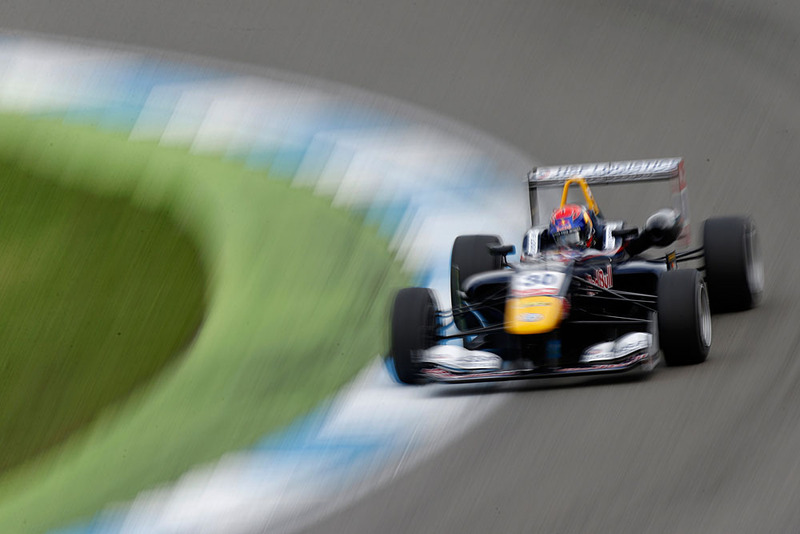 Max Verstappen won the opening FIA European Formula 3 race of the season’s final round at Hockenheim. In what amounted to a stale race, dominated from the front by the Dutch racer, Verstappen made it look easy at a circuit where overtaking can often be difficult. Verstappen led from the line, with a sluggish Lucas Auer (Mücke Motorsport) in tow, while Tom Blomqvist (Jagonya Ayam Carlin) slotted into 3rd place. Auer did press Verstappen hard initially, only for the van Amersfoort man to extend his lead significantly following the opening half-dozen tours. Thereafter, Verstappen was rarely under any kind of threat as he drew further away from Auer to win by 3.78s after 22 laps. Behind Verstappen, Auer too drove a safe race to the runner-up spot. Although the Austrian spent a touch too long in a low gear at the start, Auer had enough of an advantage to keep Blomqvist behind through the opening bends, before building a sizeable gap to the Jagonya Ayam Carlin man. Blomqvist filled out the podium places, although he was not always alone, as he led teammate Antonio Giovinazzi and Mücke’s Felix Rosenqvist home. Indeed Rosenqvist did battle with Giovinazzi for a portion of the race, only for him to drop back slightly, as he managed intentions of 6th place Jordan King (Carlin). King took the top six place after he passed Prema Powerteam’s Esteban Ocon on the ninth lap, with a decisive divebomb down the inside of the hairpin. It has been a subdued weekend for the entire Prema Powerteam squad, who appear to running on empty this weekend – their other charges Antonio Fuoco and Dennis van de Laar could do no better than 14th and 17th respectively. Gustavo Menezes brought home four valuable points for his van Amersfoort team. The American finished 3.52s ahead of Felix Serralles (Team West-Tec), who wheelbanged his way past Sean Gelael (Jagonya Ayam Carlin) on the lap ten. Jake Dennis did what he could from last place (24th). A great start ensured the Briton was as high as 17th by the end of lap on, before he took Jules Szymkowiak and Nick Cassidy to finish 15th at the flag. Michele Beretta spun himself into the barriers on lap eight, while Andy Chang and Stefano Coletti were retirements in the pits on laps 13 and 16.